I was in the pub and trying to answer the question; "Just how much does Photoshop cost?". This is normally the sort of question that the iPhone can handle - especially in pubs with wi-fi! The iPhone's lack of Flash is well known and perhaps that's related to the lack of iPhone on Adobe's Photoshop.com. I was simply amazed to have a mobile beta version of the site (which I can now see is a Flashfest) that offered me a long list of mobile phone options but which failed to provide an iPhone interface. The Web 2.0 craze has been kind to Adobe. It's saved Flash. The way Google and other search engines have struggled with Flash (it's not so much the reading of the .swf; it's the working out what to do with non-linear content or timeline keywords) pushed Flash firmly towards the 'Uurgh' side of the scale by 2005/2006. Now web designers are able to offer 'interact' and 'dynamic' sites that encourage 'coversation' and 'connectivity'. Yeah. You could use Ajax for this... but also Flash! We've seen the resurgence. This is just a fashion, though. Mobile friendly sites are almost as equally as fashionable and whereas we're already seen marketing magazines list 'Web 2.0' as the phrase they least want to hear again - mobile remains popular. The iPhone needs to support Flash. Adobe needs to buckle down and offer better iPhone, iPod Touch and mobile support. 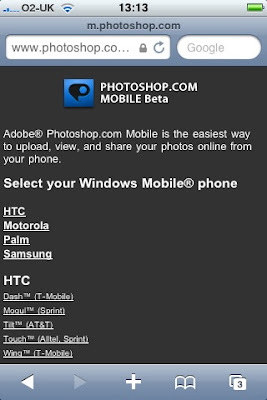 It might look as if a long list of mobile user-agents/devices is an example of Adobe making the effort - but it isn't. You simply would not get away with a web page that asked you to select whether you're on Internet Explorer, Firefox, Chrome or Safari before it let you into the content. It is even more frustrating to have to jump through that hoop when you are on a mobile device.